Saint Onouphrios (Onufri) was born in Gabrovo, Bulgaria in 1787, and was baptized with the name Matthew. His parents, Detzio and Anna, were pious, prominent and wealthy (later his father became a monk and took the name Daniel). From a young age he was able to attend school. At the age of eight or nine, he was reprimanded and punished by his parents for some mischief. Angry because of this, Matthew, in the presence of some Muslims, responded by saying that he would become a Muslim. Because of this, the Muslims sought to take him away and have him circumcised, but his parents with difficulty kept them at bay and he never became a Muslim. It appears this incident took place on the island of Chios. 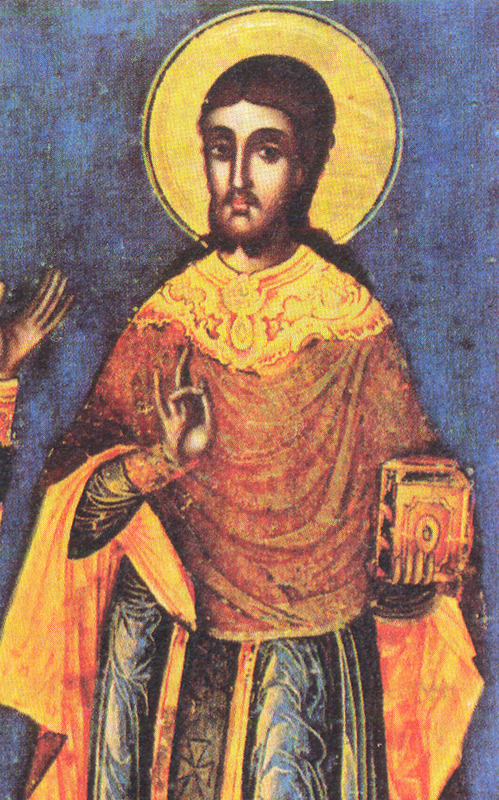 When Matthew came of age, he left for the Holy Mountain of Athos, where he entered the Serbian Monastery of Hilandari. After some years he was ordained a Deacon and took the name Manasseh. 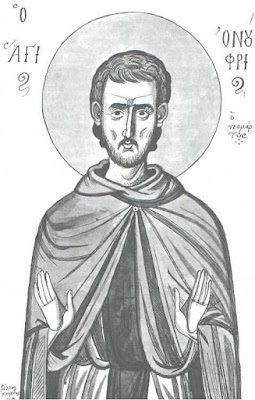 Through asceticism, prayer, fasting, obedience, vigils and the study of the sacred writings, Manasseh acquired all the virtues and became a vessel of divine grace. But the fact that he once threatened his parents to become a Muslim began to weigh heavy on him. Desiring the opportunity to confess before the Turks that he was a servant of Christ, he decided to go to the Skete of Saint John the Forerunner, where he met Elder Nikephoros whom he asked to help him prepare for martyrdom. Elder Nikephoros was an experienced spiritual father who had previously prepared the Holy New Martyrs Euthymios, Ignatios and Akakios for martyrdom. When Manasseh met Nikephoros for the first time, he told him of his desire to die for Christ as a martyr, and that he was looking for his assistance and guidance to be successful towards this end. Nikephoros responded: "I accept you but I must first say that no one should know of this. Second, you must make such trials and preparations before martyrdom as though you were undergoing the tortures of the actual martyrdom. If you agree, I will accept you." "I agree with joy," was Manasseh's response. He returned to Hilandari, where he distributed whatever he had, and made the fathers there believe he was going on a pilgrimage to the Holy Land, but in reality he secretly took up residence in a cell near Nikephoros. There he fasted with extremity, going without food or drink for days, and only then he ate bread and water, eating cooked food only on Saturday and Sunday. On top of this he would do 3,000 prostrations a day, and prayed countless prayers with the prayer rope. After four months of such trials and pains, he felt he was ready to enter the contest of martyrdom. Thus he was given the Great Schema and took the name Onouphrios. After receiving a blessing from Elder Nikephoros, Onouphrios departed for Chios. He was accompanied by Gregory the Peloponnesian, who had also accompanied the Holy New Martyrs Euthymios, Ignatios and Akakios. When he arrived in Chios, he spent an entire week in prayer and fasting. On Holy Thursday, Onouphrios made his final preparations. He shaved his beard and head, was anointed with oil from the oil lamps of a church, and he prayed there all night. In the morning he received Holy Communion from the reserved Sacrament, since on Holy and Great Friday a Divine Liturgy is prohibited. He then put on Turkish clothing and set off for the city of Chios. On the way he bought some red shoes and stopped at the Church of Saint Matrona. Onouphrios went on to the hospital and distributed what was left of his money, and stopped at the Church of the Theotokos Kecharitomene, where a Paraklesis Service was chanted on his behalf. Finally he entered the courthouse and asked for the judge. Kadi Muxurbasi appeared and Onouphrios issued his complaint, saying: "Fifteen years ago, I received such a wound in this place that since then I have traveled to various places, but I have been unable to cure the wound. This is why I have returned here again to heal it." After the judge asked what was the nature of this wound, Onouphrios replied that as a youth he denied his Orthodox Christian faith and confessed Islam, though never observed it and always remained an Orthodox Christian. But when he came of age and became cognizant of the evil he had done as a child, he became wounded in his conscience, which is why he returned to confess his Christian faith and anathematize Islam. Saying such things, Onouphrios then took his green Turkish headdress and threw it to the floor. This left all those in attendance speechless. When the judge ordered Onouphrios to pick up his headdress, he refused and took the opportunity to rebuke Islam. Those present shouted: "This man should not live long." Thus Onouphrios was arrested and taken to prison, where he endured various tortures. Remaining steadfast in his faith, Onouphrios was sentenced to be decapitated. 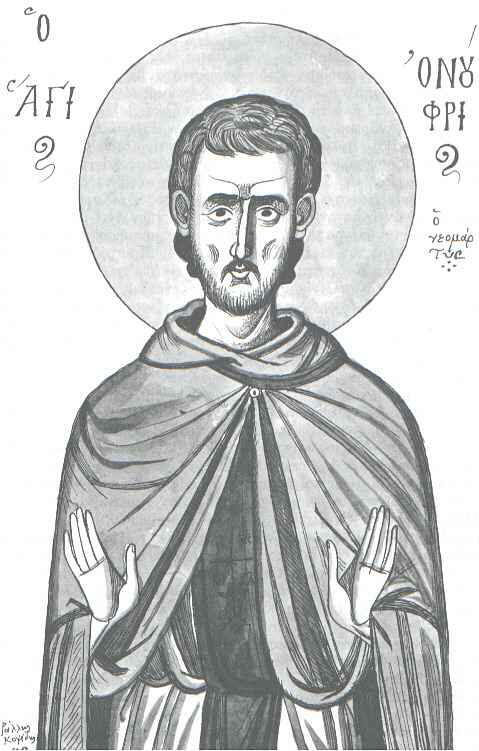 Onouphrios was therefore taken to the place of execution, where he knelt in prayer. Then a Muslim chef took his knife and stuck it into the neck of the Saint. Though the Christians desired to gather something of his relics or even some blood from the ground, the Turks forbid this and had the body gathered up with three barrels of dirt stained with his blood and put them aboard a ship, and they were dumped in the sea. And when they arrived back to shore, they washed the boat to make sure there was no blood for the Christians to gather. The Holy New Martyr Onouphrios was thus martyred in Chios in 1818 at the age of thirty-two. His relics were never found. Monk Onouphrios of Iveron wrote a Divine Office in his honor along with his biography, which was published in Athens in 1862.